Lovely words from Kevin Hunsanger of Green Apple Books on KALW about Ian Tuttle's book StretchyHead. Kevin calls this sweet collection of stories "...a cross between Richard Brautigan and Raymond Carver." StretchyHead is the first release from PACBooks, a small publishing house that spun off from Portuguese Artists Colony. It clings around your ankles, curves your back. It's bigger and badder and you squint to peer through its density. 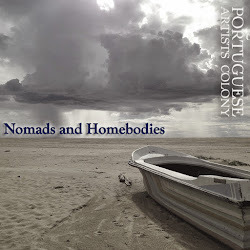 On December 18, let Portuguese Artists Colony share your burden. We will bring you heavy metals with their mineral certainty, the massive guitar solos, the weighty thoughts to remind you of your center of gravity. 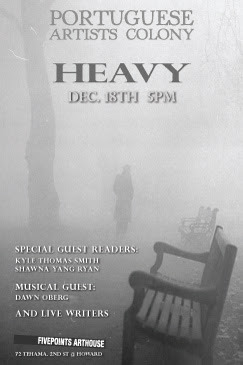 Join us in the deep of December, just days before the earth shifts its weight, wobbling back toward the longer days of light. The Boston Globe has called Shawna Yang Ryan “a writer to watch.” Her debut novel, Water Ghosts, was a San Francisco Chronicle bestseller, a Maurice Prize winner and a finalist for the Northern California Book Award and the Asian American Literary Award. Kyle Thomas Smith is the author of the novel, 85A (Bascom Hill, 2010), which has received seven awards, including one from the American Library Association's Over the Rainbow Committee, which named it one of the best books of 2010. He lives in Brooklyn with his husband Julius and his cats Marquez and Giuseppe. Suzanne Kleid returns to read the conclusion to her hilarious live writing piece inspired by the prompt, "He wore red shoes." Live music from the unmatched Dawn Oberg.